Thanks for visiting Squishy Noise dot com. Squishy Noise Percussion is my custom drum building business. Let me build you the drum of your dreams. Squishy Noise Productions is the audio side of my life: studio and location recording services. In the near future I will have some of my own compositions available for your listening pleasure. Hard to believe its been 6 or 8 months since my last update. My partner's booming business consulting group has kept me running at 110% since September of last year. So my drum workshop has laid idle until...NOW! I've got some new shells ready to be lacquered in the coming days. I've been doing monthly gigs in Big Sur with David Shiffman and Shiva Linga that have been well attended and creatively played. I'm also looking forward to seeing Mickey Hart play with Particle this weekend at The Fillmore in San Francisco. 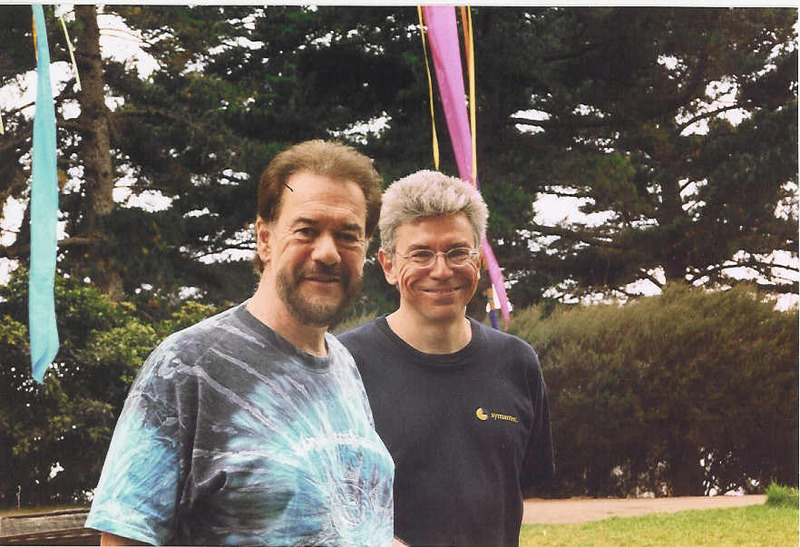 Here's a picture of Airto and myself at Esalen in Big Sur, CA. My 13 x 7 cocobolo snare drum is just about finished. I should have a picture up in the next few weeks once its done. I've got a 13"diameter x 7" depth segmented cocobolo snare drum in the works that I'm currently applying lacquer to. This drum should be a beauty to play and hold. Thanks for stopping by and checking out my thoughts.